The eviction order was announced on Monday, requesting the family to leave by Wednesday under constant threat of forcibly being evicted. The neighbourhood, Al Sheikh Jarrah, with a long history of legal struggle, has organized a local committee in an attempt to save the house – which they fear is just the beginning of a full eviction of the whole Palestinian neighbourhood. At the moment, the family the neighbourhood committee are facing a nervous wait, afraid to be evicted at any time, while trying to overrule the court ruling. 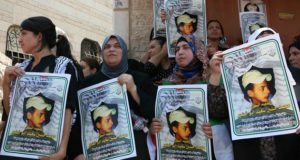 The Applied Research Institute – Jerusalem (ARIJ) have written a report on the case. 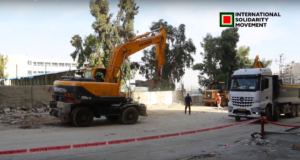 “The “High Court of Justice” has issued an evacuation order for one of the 28 houses to be evacuated and demolished in the Palestinian Al Sheikh Jarrah neighbourhood in occupied East Jerusalem. As an occupied part of the West Bank, Israel has no right to issued and carryout such decisions, especially that East Jerusalem remains one of the main issues to negotiate between the Palestinian and the Israeli sides. The Israeli court decision is neither legally justified or morally. However, and in this respect is has been leading a methodological campaign against the Palestinians’ rights and very existence in the occupied city of East Jerusalem. The storyline of Al Sheikh Jarrah neighbourhood in occupied East Jerusalem started out back in the year 1985 when the contrive of the planned neighbourhood illegally assumed control of a Palestinian expropriated property (the Shepherd Hotel) from the Israeli custodian of absentee property who has taken control of the hotel following the 1967 war, despite the fact the heirs of the rightful owner of the hotel (Grand Mufti Al-Haj Amin Al-Husseni) are still alive and long legal residents of Jerusalem. 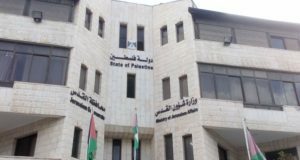 At the end of 2005, the planning committee at the Israeli municipality of Jerusalem authorized demolition of the Shepherd Hotel located in Karem Al-Mufti at the Palestinian Al Sheikh Jarrah neighbourhood -but the order was not carried out to date-; in addition to that multiple city committee approvals were needed to add and to complete the application file number 11536 submitted to the Israeli Jerusalem municipality to build a complex project on 30 Dunums (including the land where the hotel is standing), which at the time of the application is to have 90 housing units, kindergarten and a synagogue. The plan for the new Israeli neighbourhood will form the missing link between the illegal Jewish neighbourhoods stretching from Mount Scopus (south of Shepherd hotel) where Shim’oun Hatzdik Tomb area became residence to some 8 Israeli families with an additional 4 dozen of yeshiva students and a cluster of various governments institutions including the national police headquarter to the north. 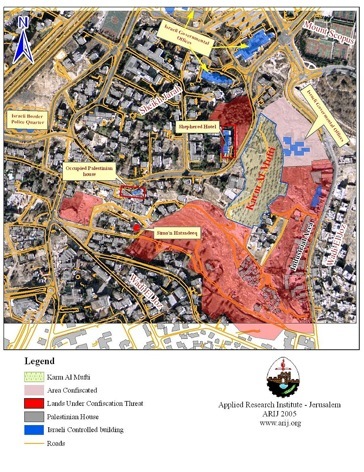 The plan for the new illegal neighbourhood goes much further than the immediate threat that hunts the shepherd hotel and its surrounding area to include an entire sector in the Al Sheikh Jarrah area called Karem Al-Mufti. In addition to the 30 Dunums that encompass the shepherd hotel and the lands surrounding it; an additional 110 Dunums (mostly cultivated with olive trees) of Karem Al-Mufti area falls under threat of being reclassified from an open and public space area to residential area once plans are developed to build a Jewish neighbourhood. Precedents to such activity took place in many areas, the most infamous of which are the Abu Ghanim Mountain and the Shu’fat hill cases; where the Israeli Jerusalem municipality reclassified the status of the mountain areas from “green areas” to residential areas; and are identified today by Israel as Har-Homa and Reches Shu’fat settlements. The plans for the new Israeli neighbourhood, if implemented would compromise the terms of the Oslo Peace Accord which prohibit any of the conflicting parties to take any action that may alter the outcome of final status negotiation over Jerusalem.